Amber Dunai is an Assistant Professor of English and Linguistics. She earned a M.A. in Linguistics at the University of North Texas and a Ph.D. in English with a focus in medieval literature at Texas A&M University. 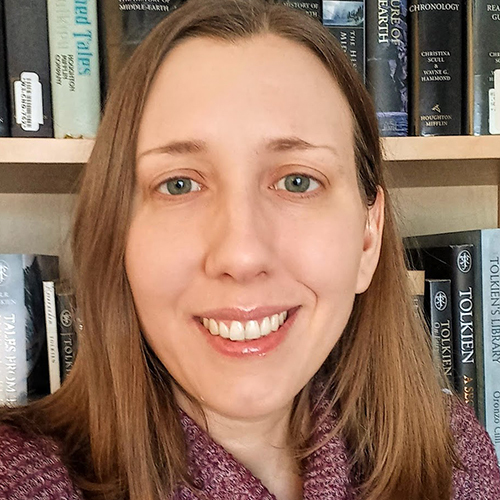 Her research interests include Middle English narratives, dream vision literature, visionary/mystical literature, and representations of the Middle Ages in popular culture. She is currently exploring uses of the dream vision narrative structure in modern speculative fiction. She has also been looking at J. R. R. Tolkien’s Beowulf translations for young readers. Her work appears in The Chaucer Review and Performance Matters. Dr. Dunai’s classes are discussion-centered. Students in her literature classes develop their critical thinking skills both through traditional research and writing assignments and through projects in which they perform interpretation and analysis through creative expression. Linguistics students can expect to put theory into practice by applying analytical tools to samples of language in the research projects they design. Dr. Dunai emphasizes the importance of identifying continuities through readings and ideas explored over the semester, and she encourages students to approach assignments in a way that puts course topics into conversation with personal and scholarly interests when possible.